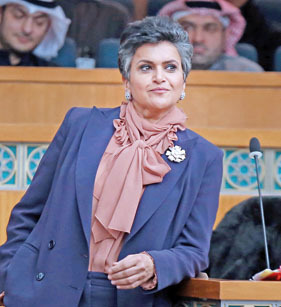 KUWAIT: Critical remarks by MP Safa Al-Hashem, the only female in the 50-seat National Assembly, about the Hijab sparked a nation-wide controversy yesterday with Islamist and conservative lawmakers and activists lashing back at the comments. Writing on her Twitter account late Wednesday, Hashem criticized a campaign sponsored by the Ministry of Awqaf and Islamic Affairs to encourage Muslim women to wear the hijab, or the head scarf. She described the campaign, made by large roadside billboards, as “strange” and is unacceptable in a civil country where the constitution guarantees personal freedom. She added that the country instead requires a campaign to strengthen national unity, adding that she called the Minister of Awqaf who promised to remove the billboards. But Hashem’s remarks were met by a storm of criticism and condemnation on the social media, all reminding her that Hijab is mandatory under Islamic teachings and that Islam is the official religion of the country under the constitution. A large number of lawmakers jumped in the fray strongly lashing out at Hashem and warning that they will resort to grillings if the minister removes the billboards. Islamist MP Abdullah Fahhad said the campaign is in line with the Islamic Sharia and the traditions of the conservative Kuwaiti society. He strongly criticized Hashem and urged the minister to remain supportive of the campaign. MP Waleed Al-Tabtabai said it is difficult to understand how some people are provoked by the picture of a woman with hijab and not bothered with the pictures of fashionistas. MP Shuaib Al-Muwaizri said the Hijab campaign is for promoting good manners while MP Saleh Ashour said the campaign’s objectives are for promoting high values and manners. Hashem’s remarks were however supported by a small number of liberal activists who insisted that this is personal freedom and should be protected. Later, Hashem explained on Twitter that she did not attack the Hijab but only insisted that wearing it is a personal decision, adding that she only questioned those behind the campaign and how it was decided and who is running it, hinting that some Islamist figures are personally benefitting from the campaign. She said she will send a parliamentary question on the issue to the government, mainly how the campaign is financed and if a feasibility study was made for the project.